When will the feds bring big banks to justice? Protesters mobilize at Freedom Plaza. Credit: Greg Kaufmann. Gisele Mata of Whittier, California, never considered herself a political activist. Other than making some calls on behalf of President Obama during the 2012 campaign, her focus was on her work, family, church and volunteering as a Girl Scout troop leader. But on Monday morning at Freedom Plaza in Washington, DC, she was ready to march to the Department of Justice, where she would risk arrest in order to save her family’s home and stand up for other people facing foreclosure. Mata was among 500 activists from across the country who came to the nation’s capital to “Bring Justice to Justice”—participating in three days of action organized by Home Defenders League and Occupy Our Homes. They were calling for the criminal prosecution of banks for ongoing illegal activity, including illegal foreclosures; and for resetting mortgages to a property’s fair market value for the more than 13 million homeowners still at risk of foreclosure. Mata and her family have been in their home for more than ten years. Their struggle began in 2009 when she and her husband were laid off from their jobs in retail and engineering, respectively. They survived by cashing out on their 401(k)s and working in low-wage jobs. “We didn’t have any problems until last year,” she said, when they no longer could afford both their home and food for their family of five. So Mata and her husband requested a mortgage modification from Bank of America. Her eldest daughter is now working as a massage therapist. Her husband is again employed as an aircraft parts quality inspector—for $13 an hour, compared to the $19 hourly wage he previously earned—and Mata earns commissions as a sales representative for an energy company. But the high interest payments they are paying force them to choose between a roof over their head or food for the family. But even as the Matas continue to make their payments, Bank of America continues to push for foreclosure. Her dealings with the bank in an effort to get a modification tell a story that is now all too familiar in this country. Ann Haines of St. Paul, Minnesota, was also ready to get arrested after experiencing an even more extreme nightmare in dealing with US Bank. She had lived in her home with her three sons for thirteen years, and was struggling to meet a monthly mortgage payment that had risen from $800 to $1300. Instead, what she got was US Bank telling her to stop making payments for three months so she would be eligible for a modification, followed by the bank sending her the wrong modification application. She then arrived home one day to find her locks changed and a realtor going out her back door. The bank proceeded with a sheriff’s sale. “It was terrifying and you don’t know what to do,” said Haines. Haines hooked up with Occupy Homes MN and traveled last month to the US Bank shareholders meeting in Boise, Idaho, to confront CEO Richard Davis. “Two days later the eviction case was magically closed,” said Haines. She described herself as “elated” that she no longer fears losing her home at any moment. But she still felt the need to be in Washington, DC, to support other struggling homeowners. Cammy Dupuy of Gonzales, Louisiana, isn’t affiliated with any particular group—she had learned about the action in recent weeks on the Internet. She was also prepared for arrest, though not particularly looking forward to it. Since 2006, Dupuy’s mortgage has had so many different banks and loan servicers attached to it that the trail is dizzying. As a result, she has had her paperwork lost as servicers change, not been provided new mailing addresses for payments, fought off two sheriff’s sales and even received modification “offers” that would have had her paying double-digit interest rates and waiving her right to sue for the mishandling of her note. Throughout her struggle, Dupuy has found herself alone. By the end of the day on Monday, Mata was arrested on the steps of the Department of Justice along with sixteen other nonviolent activists. (The nonviolence by activists didn’t translate to nonviolent arrests by Homeland Security officers, who used tasers.) The demonstrators had set up an encampment and also blocked traffic along a very busy Constitution Avenue. Mata and others didn’t give their names when booked—they didn’t want this to be just another routine booking and quick release—so she was held until Tuesday evening. “I told them I was [Bank of America CEO] Brian Moynihan,” said Mata, and many of the other demonstrators who were arrested used the names of bank CEOs as well. Dupuy was arrested along with six other homeowners Wednesday morning while blocking the lobby entrance to Covington & Burling—a prominent international law firm that has represented JP Morgan Chase, Bank of America, UBS and other major banks. Haines was one of the demonstrators blocking the entrance too, but because she was on the outside of the building, police just removed her from the space. In addition to representing the large banks, organizers said the law firm epitomizes the “revolving door” between serving government and serving Wall Street’s interests, noting that Attorney General Eric Holder was a partner at Covington & Burling before coming to the DOJ, and former Assistant Attorney General Lanny Breuer left his post in March to become vice chair of the firm. For three straight days, these homeowners and their supporters—mostly low-income people of color—demonstrated what it means to personally sacrifice for the good of others, to move beyond hopeful words to deeds and actions. I hope that those of us who seek change feel their urgency, and will follow their lead to take more and greater action—together. The state legislature responded by creating a “general education levy” that equalized and created dedicated funding for schools, and also lowered property taxes. But then along came Governor Jesse “The Body” Ventura who body-slammed the levy, and Governor Tim Pawlenty who presided over nearly a decade of disinvestment from schools and taking from school appropriations to plug other holes in the budget. “As a result, we’ve now got ten or eleven four-day school districts, and other than core curriculum, everything else is cut out—arts, music, in some cases languages,” said Nieters. But this week the state reaffirmed its commitment to education. At a time when so many states are opting to close schools that primarily serve low-income students, Minnesota passed a budget that closes corporate tax loopholes and increases education funding and equity. The 2013 budget erases the state’s $627 million budget deficit, raises the income tax by 2 percent on the wealthiest 2 percent of Minnesotans, raises $424 million by closing corporate tax loopholes and reduces property taxes by $400 million. The budget uses new revenues to make key investments in education, including: fully funding optional, all-day kindergarten; increasing special education funding by $236 million; and importantly, passing two levies that will make funding for all school districts more reliable, while also providing additional resources to local districts with the greatest need. She said the budget was achieved by the union and its progressive allies reaching out to groups all across the state that were pursuing a “common interest of stronger communities [through] an educated society and workforce.” They began organizing prior to the 2012 election with a message that wealthy individuals and corporations must pay their fair share in order to strengthen education. Many Democrats ran on that platform, and the party picked up enough seats to win majorities in both the House and Senate. After the election, the grassroots coalition kept the pressure on the newly elected legislators to follow through on their commitments. In the last few months alone, there were thousands of calls, visits, letters and e-mails to representatives, and a “Students’ Day” for parents and children at the Capitol, with students from kindergarten through high school attending. The budget was passed Monday night by the legislature, and Democratic Governor Mark Dayton signed it into law yesterday. On Sunday, the Minnesota House of Representatives passed the Homeowners’ Bill of Rights by a bipartisan 123-0 vote. The Senate passed a companion bill last week, so now it just awaits Governor Dayton’s signature. Ann Haines, the homeowner from St. Paul interviewed in the DOJ story above, testified along with other homeowners at a House hearing on the bill in January. I always expect the worst from the House Republicans when it comes to SNAP (food stamps) and the Farm Bill. So while much attention and anger has been focused on the $20.5 billion cut proposed by the House Agriculture Committee—which would take food stamps away from nearly 2 million people and result in several hundred thousand low-income children no longer receiving free school meals—my reaction was more along the lines of… yeah, what did you expect? Unfortunately, the committee failed to pass Senator Gillibrand’s amendment, and Senate Democrats proved yet again that the party’s commitment to those who are the most economically vulnerable is about as thin as Republican cut proposals are deep. Senator David Vitter offered—and Senate Democrats accepted—an amendment that would increase hardship and will likely have strongly racially discriminatory effects. [It] would bar from SNAP, for life, anyone who was ever convicted of one of a specified list of violent crimes at any time—even if they committed the crime decades ago in their youth and have served their sentence, paid their debt to society, and been a good citizen ever since…. The amendment would [also] mean lower SNAP benefits for their children and other family members. So, a young man who was convicted of a single crime at age 19 who then reforms and is now elderly, poor, and raising grandchildren would be thrown off SNAP, and his grandchildren’s benefits would be cut…. Senator Vitter hawked his amendment as one to prevent murderers and rapists from getting food stamps. Democrats accepted it without trying to modify it to address its most ill-considered aspects. Antipoverty advocates suggest contacting your senators—particularly Harry Reid, Debbie Stabenow and Richard Durbin—to tell them that you oppose this provision. They suggest doing it as soon as possible since it’s unclear how quickly the Farm Bill will move. You might also suggest to them that the party check Lost and Found for its spine, too. Congresswoman Barbara Lee and Democratic Whip Steny Hoyer introduced the Half-in-Ten Act of 2013, which would establish the Federal Interagency Working Group on Reducing Poverty. The working group would develop and implement a national strategy to reduce poverty by half in ten years, integrating federal policies on poverty reduction, and also provide regular progress reports to Congress. I would imagine this bill has about as much a shot at passing the House as this blog has at becoming Speaker Boehner’s favorite bedtime reading. Nevertheless, I’m always thankful for Representative Lee—I’m glad the Democratic whip is supporting her efforts—and it’s always worthwhile to keep up with her work and listen to what she has to say. Senator Bernie Sanders, chairman of the Senate Subcommittee on Primary Health and Aging, introduced legislation yesterday to reauthorize and strengthen the Older Americans Act, which supports Meals on Wheels and other critical programs for seniors such as in-home care, transportation, benefits access, caregiver support, chronic disease self-management, job training and placement and elder abuse prevention. “With 10,000 Americans turning 65 every day, our country’s growing population of seniors includes many who rely on these critical programs to help them stay in their own homes and communities,” said Sanders, speaking at an Older Americans Summit. Funding has not kept pace with the growth in need or numbers, and recent cuts before the sequester hit have further eroded investments in key services. The bill would also require the Bureau of Labor Statistics to create a consumer price index for the elderly that would account for spending on high-inflation goods and services like healthcare, prescription drugs and heating homes. A Bold Approach to the Jobs Emergency (Tuesday, June 4, 8:30 am – 4 pm, 20 F Street NW Conference Center, Washington, DC) We have a US jobs emergency. More than 11 million Americans are still out of work, and the austerity push is only making matters worse. States have been forced to implement deep cuts to emergency unemployment benefits even though almost 40 percent of the unemployed have been jobless for more than six months. Great panels—with great people—on how to create good jobs and raise labor standards. Among the participants: Dean Baker, Maya Wiley, Ellen Bravo, Sarah Bloom Raskin, Nona Willis Aronowitz, Dorian Warren, Annette Bernhardt, Ai-Jen Poo, Gar Alperovitz, Joseph Geevarghese, Madeline Janis and Deepak Bhargava. Presented by the Roosevelt Institute. Register here. 2013 Mississippi on the Potomac Reception (Tuesday, June 4, 6:30 pm – 8:30 pm, AFL-CIO, 815 16th Street, NW, Washington, DC) The event marks the tenth anniversary of the Mississippi Center for Justice, a not-for-profit public interest legal organization that works against the odds to provide legal assistance to some of the most vulnerable and neglected communities in Mississippi, the poorest state in the country. For more information about the reception, contact Lauren Welford at 601-709-0859 or lwelford@mscenterforjustice.org, or click here to sponsor the event or purchase individual tickets. “A State-by-State Snapshot of Poverty Among Seniors,” Zachary Levinson, Anthony Damico, Juliette Cubanski and Patricia Neuman. Kaiser Family Foundation. The Census Bureau’s standard poverty measure is based on food costs, family size and age of family members. A more recent, supplemental measure covers a range of other poverty-related factors, including homeowner status, regional differences in housing prices, tax credits, in-kind benefits and expenses ranging from income taxes to healthcare. For seniors, half of whom spent at least 16 percent of income on healthcare in 2009, this last factor is critical. Under the supplemental measure, this report finds, the senior poverty rate is higher in every state, at least twice as high in twelve states and roughly 20 percent in six states (California, Hawaii, Louisiana, Nevada, Georgia and New York). Nationally, the senior poverty rate is 15 percent under the supplemental measure, compared to 9 percent under the official measure. For incomes below 200 percent of the poverty level, the percentage of seniors increases from 34 to 48 percent under the supplemental measure. These findings, the authors say, weigh critically on Medicare and Social Security policy. “The Economic Security Scorecard: Policy and Security in the States,” Wider Opportunity for Women. What constitutes economic security? This report hones in on twenty state-level policy areas covering eighty-five policies: income and job standards, including minimum wages, state earned income tax credits, paid sick leave and unemployment insurance; saving and asset policies, including college savings and retirement plans; supports including childcare assistance, medical assistance and property tax relief; and education and workforce training policy. The report evaluates states according to their performance in each of these areas. Washington is the only state that receives higher than a C grade (B-), followed by Vermont and Oregon (C+). Scoring D+, Mississippi, Alabama and Utah anchor the bottom of the rankings. The report finds that a state’s budget size, median income and overall fiscal health are not strongly related to its economic security score. It finds a stronger relationship between education levels and security; among the top five states, an average of 35.1 percent of residents have a bachelor’s degree, compared to 24.1 percent for the bottom five. Overall, it finds, most states fall short on job quality standards. “The Wall Street Wrecking Ball: What Foreclosures Are Costing Us and Why We Need to Reset Seattle Mortgages,” United Black Clergy and Washington Community Action Network. Across the country, and particularly among people of color, homeowners are still feeling the aftershock of the financial crisis. This report shines a spotlight on Seattle. A staggering 33.5 percent of Seattle homeowners, 42,411 in total, are underwater on their mortgages. 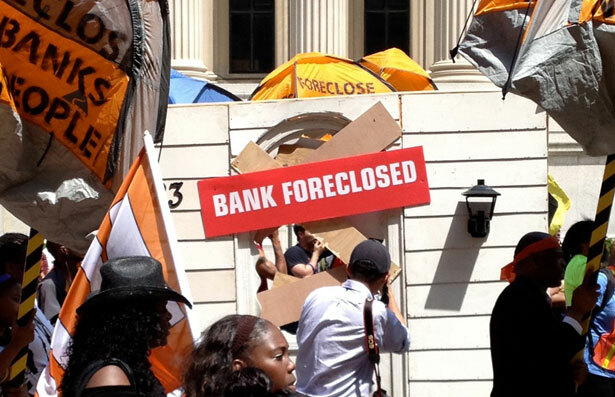 Between 2008 and 2012, 16,515 homes were foreclosed on. The report estimates that if banks reset these underwater mortgages to fair market value, homeowners would save an average of $9,253 annually, pumping $392 million into the local economy and helping to create 5,800 jobs.